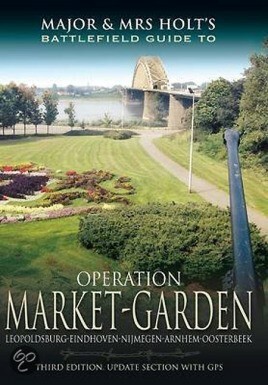 Operation Market Garden was the name given to the US, UK and Polish airborne assault on the Arnhem, Nijmegen and Eindhoven bridges and the ill-fated 30 Corps advance to relieve the hard-pressed paras. While everyone knows that Arnhem was 'a bridge too far', few understand the true reasons for the catastrophic failure to link up. There have been numerous guide books to the fighting around Arnhem in particular but this is the first to tell the whole story as it happened. As the many thousands of satisfied Holt's Guide readers know, the authors have an uncanny knack of getting to the nub of the story, explaining the action clearly and directing the visitor to the key sites in order that he/she gets the most from any visit. With its full colour touring map The Holt's Battlefield Guide to Market Garden will prove as big a success as its forerunners, on both sides of the Atlantic and the Channel. Major and Mrs Holt founded the first organisation to offer battlefield tours to the general public in the late 1970s. Since the 1990s they have been writing their series of guide books, incorporating all that they have learned from their experiences conducting thousands of people around battlefields. This series, designed to serve as companions for travellers, whether sitting at home or physically visiting the battlefields, includes detailed travel directions, military history, fascinating anecdotes and tourist information. The Holts share the writing of their books equally and conduct all their own research, spending many weeks on the ground as they prepare each new book or update previously published titles. Major and Mrs Holt have long been setting the benchmark for superb battlefield guides, and this third edition, ambitiously covering the entire Operation Market Garden area, certainly adds to that reputation. Sweet William or the Butcher?